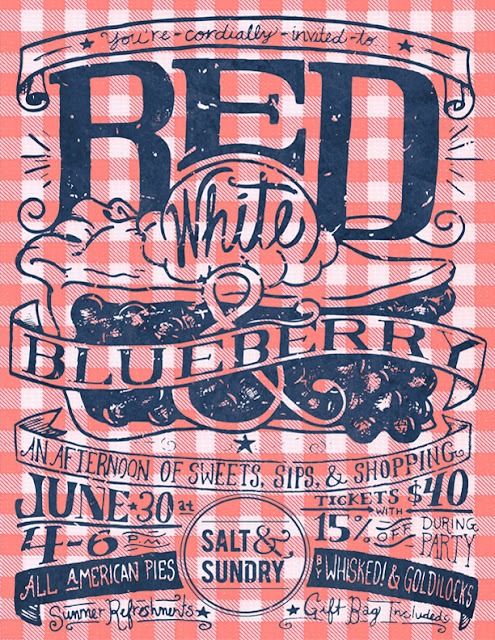 amanda mcclements & metrocurean: PARTY } You're Invited to Red, White & Blueberry! PARTY } You're Invited to Red, White & Blueberry! Salt & Sundry is teaming up with local baking mavens Goldilocks Goodies and Whisked! for a very special event in a few weeks. Come spend the afternoon indulging in handcrafted pies, sipping summer thirst quenchers and shopping with an exclusive event discount. • A selection of all-American pies and treats by Goldilocks and Whisked! • An exclusive 15% off Salt & Sundry's collection of home goods during the event. • A gift bag packed with summer goodies (a $45 value), plus recipes from Goldilocks' Emily Robins and Whisked! 's Jenna Huntsberger. • Summer refreshments and savory bites. Goldilocks Goodies are fresh-baked gluten-free treats that are just right: all natural, delicious, and made with premium ingredients in Lancaster County, PA. Whisked! is a DC-based bakery specializing in sweet and savory pies, quiches, cookies and other American classics. Salt & Sundry is DC's new go-to source for a beautifully curated selection of tableware, barware, linens, artisan foods and covetable vintage finds. For questions about the event, please contact Salt & Sundry at 202.556.1866 or drop us a line at hi@shopsaltandsundry.com.